Live web streaming and 7 hours of luge action on NBCSN on tap for this season. 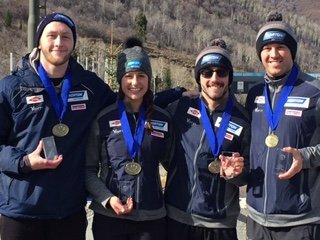 Champions crowned in Park City before heading to Europe. Photo by Meredith Kelly. Igls, Austria - November 25, 2015 - The chase begins Saturday in Igls, Austria, just outside two-time Winter Olympic host Innsbruck. The 2015-2016 Viessmann World Cup luge season commences at the site where the sport made its Olympic debut in 1964. The Games returned to Innsbruck in 1976. The storied site now annually hosts the International Children’s Games, and nearly four years ago, it debuted the winter Youth Olympic Games that saw USA Luge score a gold medal in the team relay. Igls will also be the venue for the FIL’s first ever live web stream of World Cup and World Championship luge racing, via the FIL website. It is offered in coordination with JFM Sports of Lake Placid, which is charged with establishing production facilities at the Lake Placid, Park City and Calgary racing venues. The live stream for the three North American races in December will also be carried on the USA Luge website. USA Luge fans and supporters celebrated the momentous announcement this week, thus ending their search for nefarious websites that might carry a pirated signal of the fastest sport on ice. The streams will be accompanied by English language commentary. Also, NBC Sports Network (NBCSN), in partnership with the FIL, USA Luge and Carr-Hughes Productions in Saratoga Springs, N.Y., which will handle post-production chores, will bring seven hours of luge racing to its cable television platform. The NBCSN coverage is made possible through financial contributions from the United States Olympic Committee, Norton/Saint-Gobain, Dow, I Love NY and the Utah Sports Commission. The Lake Placid World Cup series will air on NBCSN December 10 from 7-9 PM ET. The Park City World Cup events will be broadcast December 17, also from 7-9 PM ET. The Calgary World Cup airs December 27 from 4-5 PM ET, and the World Championships from Koenigssee, Germany can be viewed February 11 from 6:30-8:30 PM. Now a team that won 13 World Cup medals last winter, with the same athletes and more, will be easy to find online and on television. While FIL officials and USA Luge leadership crafted the final elements of these arrangements in recent weeks, team members have been traveling, training, and in some cases, fighting weather abroad for good conditions. After training in Lake Placid and Park City in October, the American team arrived in Altenberg, Germany in early November for a week of sliding. Thereafter, the group moved to Winterberg, Germany, where conditions were anything but winter-like. The national team saw several days of warm temperatures and pouring rain, which canceled their sessions. “It was decided that we would not stay in Winterberg for the week as planned, and instead head to our next destination early, where our first race is being held,” reported 2014 Olympian Summer Britcher of Glen Rock, Pa., on her Facebook page. “Thursday morning (Nov. 19) at 4 AM we started the eight and a half hour drive to Igls, Austria. When we arrived, we were at our hotel for less than 30 minutes before we had to leave for a training session that afternoon. Conditions in Igls have been different, actually looking like a winter berg. Nations Cup qualifying takes place on Friday at 3:30 AM Eastern Time. The women’s and doubles races will take place Saturday starting at 4 AM Eastern Time. Men’s singles and the team relay begin Sunday at 4:15 AM. Who Responds To The Voiceless? Subject: LongIsland.com - Your Name sent you Article details of "The Long Wait is Over as World Cup Luge Season Begins for 12 US Athletes This Weekend in Austria"